Why presentations are important for engineers and how they can improve their presentation skills? The best way to kill your fear is to speak in front of public and making presentation to express your verdict with emphasis. 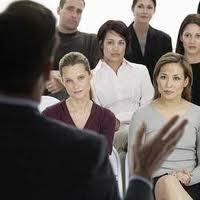 Like any other profession, Presentation skills hold an eminent position in the life of an engineer. A standardized and systematic approach involving effective knowledge, practice and constructive feedback opens path to a distinct presentation skills. The fact that majority of students being shy, avoid public speaking at junior levels of their college life comes in as a downside at a later stage in their profession life where they lack necessary basis to present. Hence to cater this problem, universities must focus on every engineering student to extensively take part in presentations; the best way to do so being asking students to make presentation for every single coursework projects that they are a part of and express their view in front of the whole class. After being hired as a fresh graduate, you may be required to meet the higher management and deliver presentations for the amount of work you have done till a said time. Being new at the organization, every associate looks forward to have high expectations from you and to meet the desired standards you must be excellent while delivering. This is why presentation skills for engineers are of high importance. The basic thing to go on for a making a presentation is to be clear of your target audience and make presentation according to how they would perceive it easily. For instance if you are a computer engineer, make sure that all the specifications, programming assignment or test cases delivery that you are a part of, is effectively translated to the higher management so that they make take further stance on it. If not delivered in an understandable manner, it will be of no use to them and the project might go in vain. Similarly a mechanical or electrical engineer must be sure of what he has learned and how is he going to deliver it further to the leads. Jotting down of major points to emphasize is always a good practice. This is the point where you get to know people when they communicate with you over your work done, hence analysis of the major points is always crucial. It is always a wise practice to look your audience in their eyes while speaking; this not only imparts your viewpoint but also gives you confidence to speak correctly. Avoid using too many bright colors in the slides; if possible use engineering logos at the background which reflect your thoughts and viewpoints. You can get people engaged in the presentation by asking questions at various intervals and answering them simultaneously. When done with conveying your message, ask questions from the public and go for an honest opinion to judge how accurately your message was delivered. Madam i am very afraid of presentations. There is a fear inside me. I am not very confident. I am a student of engineering and i want to improve my presentation skills. Whenever i have a presentation, my heart starts beating very fast and pulse rate speeds up. How can i control my nerves during interview? Hey Nandni, i am glad to see your comment here. We are only afraid of things that we don't practice. What's the fear? It happens to everyone. When a child in school goes for a speech, he is afraid. When you prepare your first presentation in college, you are afraid. But this never means that we can never give a good presentation. So it's all about time. You will realize that after giving a few more presentations all your fears will be gone. Just be confident. Let the people laugh if the do so. I agree with Professor. Breathing exercise can help you control your pulse rates during presentations. Brother it's only about practice. The more you will engage with other people, you will feel more confident. I was also the same at start but over time i have killed my shyness. Presentation skills improve with practice. Specially when you are on job and you interact with so many people on daily basis, your shyness will be gone in a few weeks.